Northeastern Wisconsin and Northwest Michigan have a lot in common. Situated across Lake Michigan from each other, the scenery boasts rolling countryside, magnificent lake views, and miles of beautiful beaches. Traverse City to Green Bay the Easy Way! Should you wish to travel from Traverse City to Green Bay, the S.S. Badger is the way to go. Take a scenic drive of less than two hours from Traverse City to Ludington, Michigan. 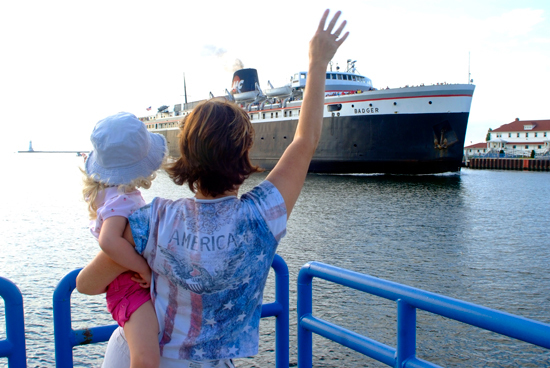 Ludington is the home port of the Lake Michigan Carferry, and a wonderful community to visit. In Ludington, you can board the S.S. Badger carferry and enjoy a relaxing four hour cruise to Manitowoc, Wisconsin. Once in Manitowoc, you have less than an hour's drive to Green Bay. The fun isn't just found on land...there are lots of entertaining activities aboard the S.S. Badger as it makes its four hour trip across Lake Michigan. Find a lounge chair out on the spacious deck and soak up the sun, play Badger Bingo, watch a movie, shop in the Badger Boatique, or enjoy a meal or drink. The trip will fly by, and you may not want to disembark!